CNG: Printed Auction CNG 75. BAKTRIA, Greco-Baktrian Kingdom. 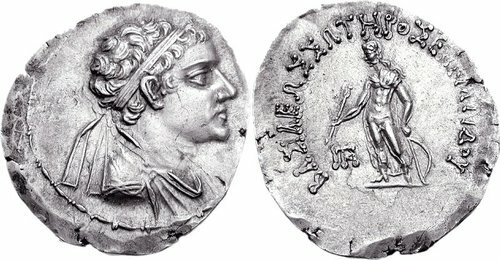 Eukratides II. Circa 145-140 BC. AR Tetradrachm (16.48 g, 12h). Sale: CNG 75, Lot: 650. Estimate $1000. Sold For $1210. This amount does not include the buyer’s fee. BAKTRIA, Greco-Baktrian Kingdom. Eukratides II. Circa 145-140 BC. AR Tetradrachm (16.48 g, 12h). Diademed and draped bust right / Apollo standing left, holding arrow and bow. Bopearachchi Série 3B; SNG ANS 625-6. Good VF, toned, light double strike. Very rare type with circular legend; the first to appear at auction.